"UNTANGLING THE COMPLEXITIES OF EFULFILLMENT"
As consumers gain greater connectivity to retailers by means of eCommerce, their already high demands become increasingly challenging for businesses to meet. Until recently, order fulfillment was a simple function for supply chains. But with the increasing expectations, the changing nature of order fulfillment presents a whole new set of complexities. "Improving Order and Fulfillment Operations: PUrchase order management"
Companies tell us they're facing critical challenges to managing supplier compliance, consistent communication and access to accurate data. Having the right purchase order management system in place can really help, but then you have to use it correctly. Global supply chains are growing ever more complex, so it's time to address the issue. The research examined organizations' adoption of a supply chain segmentation strategy and implementation, and how their investments and commitment to a segmented approach is delivering enhanced process efficiencies, better inventory management, and improved customer service. Regardless of the term, the market is moving to a buy from anywhere/ship from anywhere/deliver to anywhere distribution model. Customers can buy an item in a retail store, over the Internet from a PC or laptop in their home or office, from their smartphone or their tablet or do it the old-fashioned way and ring up a call center. That order can be filled from a distribution center, a 3PL, a retail store or drop shipped from a manufacturer or a vendor. And it can be shipped directly to the customer’s residence or business, picked up at a store or delivered for pickup at a third party location. 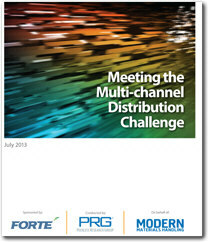 While multi-channel distribution is thought of as a retail phenomenon, a study conducted by Peerless Research Group on behalf of Modern Materials Handling magazine for FORTE showed that distributors and manufacturers are also under pressure to meet the challenges of multi-channel distribution. Manufacturers and shippers are facing increasing difficulty in their ability to bring product to market in a speedy and cost-effective manner. Companies are driven to reduce inventory levels as the cost of carrying any excessive finished goods is becoming prohibitive. To aid in their ability to get product to market in a timely, cost-efficient manner, as well as to better leverage demand forecasts, supply chain managers are turning to an array of non-traditional solutions. One such program is “product customization” which allows for tasks such as light assembly, kitting, as well as other value-added services to be postponed right up until final distribution. This flexibility reduces the risk of carrying surplus inventory and enables manufacturers and product distributors to modify the base product to fully satisfy customer demands. The motivating force behind the demand for these capabilities is to help manufacturers and shippers have better control over inventory, help companies better leverage their supply chains to improve profitability, and be able to meet customer demands in an efficient and expeditious manner. A recent survey conducted by Peerless Research Group validated the overwhelming desire for manufacturers and shippers to reduce supply chain costs, lower inventory levels, build more flexible supply chains, be more responsive to customers, and create more efficient ways of getting product to market. Canada is far and away the largest trading partner of the United States. That makes economic, political, and geographic sense, given the longstanding history of free trade, political stability, and friendly relations between the two North American allies. The U.S. Census Bureau reports that in 2012, $292 billion in goods were exported to Canada from the U.S.
A common misconception is that the Canadian logistics market is simply an extension of the U.S. market. It isn’t; and believing Canada is a simple “extension” is the root cause of most mistakes made in cross-border shipping. Moving shipments into Canada can be a challenge. Or, more accurately, it can be a series of challenges.